The original Charlie Company site. This site was created by Mark Hendrickson and assisted many men to find and link up with old buddies. Texas Tech, the Vietnam Center and Archive. Contains archived information about the Viet Nam war. Texas Tech map archives. Contains maps of all areas of Viet Nam, including 1:50,000 scale tactical maps used by Charlie Company. These can be downloaded in .pdf format and printed. The quality is fairly good. The "Coffelt" database. This contains a list of all men killed during the war, including date of death, unit, and other information. It is based on government information. There are a few cases where a man's unit is misidentified, for example, listing 1/502d Inf where it should be 1/506th inf. 506th Infantry Regiment web site. From World War II to Viet Nam and Iraq/Afghanistan, this site is full of useful information. They also have a quartermaster store for hats, t-shirts and other items. 101st Airborne Division web site. Ripcord Association. Charlie Company defended Ripcord for about a week in June, 1970. 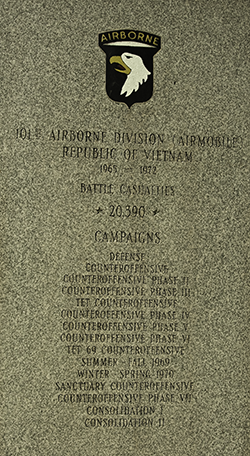 Delta, 1/506th was OPCON to 2/506th Inf during the heavy fighting in mid July 1970 and lost several members of the company. The Wall web site. Allows you to search by name to find information about men killed during the war. Visitors to the site are able to add remembrances and attach photos. The Virtual Wall web site. Similar to the wall web site. Photos and comments may be submitted for inclusion on this site. US Geological Survey Topo Maps. Go to products/topo maps/usgs store. National Archives. This is where the battle records for the Viet Nam war are maintained. Non-commissioned Officer Candidate School (NCOC) Locator. The N.C.O.C. Locator is the site for the Noncommissioned Officer Candidates who were called, Shake n' Bakes - Instant NCO's. They were the men trained to be Platoon Sergeants and Squad Leaders in Infantry Companies in Vietnam. During the Vietnam War, Ft. Benning trained and graduated over 26,000 men to fill the slots of Senior NCO's who were either retiring or being killed and wounded in Vietnam. The program went from the fall of 1967 to March 1972. We lost 1,114 men in Vietnam. The group earned 4 Congressional Medals of Honor, 18 Distinguished Service Crosses, 51 Silver Stars and Countless Bronze Star Medals with Valor and a ton of Purple Hearts. Check out the NCOC honor wall on the site. Earthpoint. This is an excellent site that allows you to convert military grids into latitude/longtitude that can be pasted into google earth. Select "convert coordinates" on the left and then enter the grid in the "position" cell. Use the the grid zone designator (the northern maps are 48Q and southern are 48P) and the 100,000 square (such as YD or XT) in front of the actual coordinate numbers. These items are in the lower right of the 1:50,000 mapsheets. Example is 48QYC5681 for Camp Evans. This tool does not require a subscription. University of Texas Maps. Most if not all 1:50,000 scale maps are available for download in .pdf format.